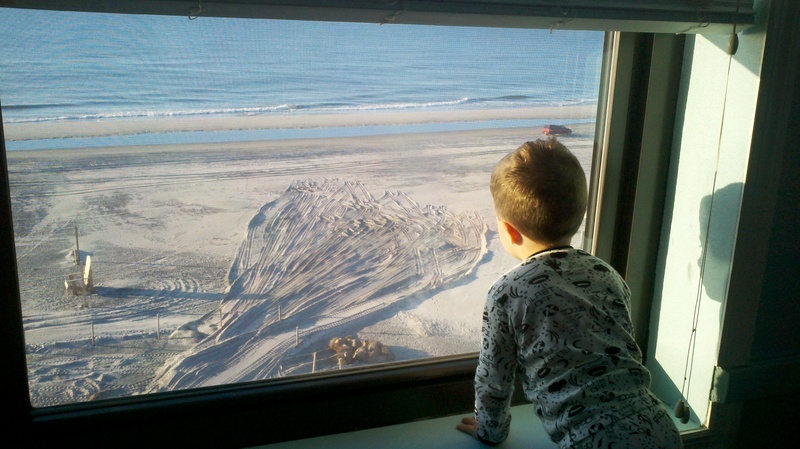 I was fortunate enough to stay in an oceanfront suite in the tiny town of Brigantine, New Jersey with my two year old son for a few days. I really enjoyed their pristine beaches and figured what better way to find out about a town then to eat my way around it. Each stop had not only my critiques, but also my son’s as well. This is why you see two entrees in each picture. It was my first visit to this tiny beach destination and I have a feeling after enjoying my time there, it will not be my last. They claim “Best Food in Town” on their menu. I wouldn’t go that far. What they did provide was better than average “Americanized Chinese Food”, a cozy dining atmosphere, very friendly service and a really nice looking sushi bar that I would not mind to try the next time I stop in. Very eclectic with decorations from a variety of different themes. The place is dated, but has that nostalgic dining beachy feel to it that resonates warmly in my heart from my youth. They served a really great breakfast. A for sale sign outside the restaurant so they may not be there much longer, which would be a sad day in my opinion. The service here was outstanding. The food was slightly better than average and I liked the fresh fruit brought out for my son’s platter. They have the word “fresh” on their sign. I would have enjoyed the meal more if the fries were indeed fresh-cut fries and the roasted peppers in my sandwich not of the canned variety and fresh instead. Food was good, just not great. One of the worst meals I have been served in a long time. I should have known better and leave immediately when I asked if they had any specials for the night and the waitress told me that main chef who does the specials was not in yet even though it was five o’clock at night. I think they may not have had any chef at all back in the kitchen. I took a bite out of two different pieces of veal and they both literally tasted rotten. The only saving grace was that I was able to eat the mushrooms and sliced onions if that is any consolation for spending twenty some odd dollars on this dish. I was also able to eat the bread that they served with the meal. The bread was warm and perfect for soaking up the sauce that sadly did not seem homemade either. I am sure the server knew something was up with not a single piece of veal was eaten from the plate when she took it away. One of the best retrofits of what looks like a former Wawa to me. Also, there must be something with breakfast joints and pirates on this island. Again another outstanding breakfast, with service that was just above and beyond personable and efficient. They even gave my son a little pirate cloth bag as a present for stopping by. A really nice, tasty, and affordable lunch with a phenomenal clams casino appetizer. The clams casino wasn hands down a reason to drive down to Brigantine alone if they are this good every time there. The restaurant is connected to a bar that was hopping with patrons and music was pumping. If the little guy was not with me, I could see enjoying a decent meal with a couple cold adult beverages here. Posted in Restaurants and tagged Andres Italian Restaurant & Wine Bar, Andres Italian Restaurant & Wine Bar brigantine, Andres Italian Restaurant & Wine Bar brigantine review, best breakfast in brigantine, best dinner in brigantine, best lunch in brigantine, bites of brigantine, brigantine new jersey, Mad Dog Morgan’s, Mad Dog Morgan’s brigantine, Mad Dog Morgan’s brigantine review, pirates den brigantine review, St. George’s Pub, St. George’s Pub and package goods, St. George’s Pub brigantine review, the pirates den, the pirates den brigantine closing, where to buy beer in brigantine, where to eat in brigantine new jersey, worst place to eat in brigantine, yianni's cafe, yianni's cafe brigantine review, Yuki Hana, Yuki Hana brigantine review. Bookmark the permalink.